This fast cutting 16 gauge Shear can handle the toughest jobs, you can even cut stainless steel up to 18 gauge. Scroll cuts are a snap with the easy to hold back handle design. Easily adjusted blades make for easy work adjustment. The 6805 shear will leave a smooth, burr free edge, ready to be finished. This is a handy tool for sheet metal work, and even is used on the farm for metal fabrication. 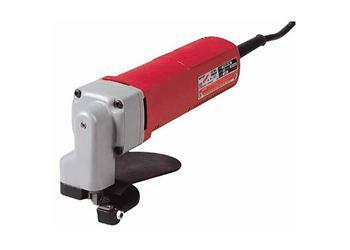 Fast, easy, clean cuts in metal are just what this tool provides. Minimum Radius Right 1 in. Minimum Radius Left 1/2 in. Capacity in Stainless 18 Ga.
Capacity in Steel 16 Ga.